All of the astronauts picked by NASA to participate in its maiden manned space programs, Mercury and Gemini, were white males. However, behind the scenes, there was a dedicated team of African-American, female mathematicians who played a pivotal role in ensuring that they launched and returned safely, whether from orbiting the Earth or a mission to the moon. Equipped only with pencils and slide rules, these so-called "human computers" were among the best and the brightest minds recruited by NASA to do the critical calculations needed to win the space race with Russia. Author Margot Lee Shetterly gave these unsung heroines their due in "Hidden Figures," a best seller belatedly crediting their quantitative contributions to the cause. Besides chronicling their considerable accomplishments, the book also recounted the indignities these brilliant black women simultaneously suffered, simply because they had the misfortune to be living in Virginia during the dark days of Jim Crow. Back then, African-American brainiacs employed by NASA were automatically assigned to work in its segregated West Computing Group. Directed by Theodore Melfi (St. Vincent), the overlooked icons' story has now been adapted to the big screen as an uplifting, overcoming-the-odds docudrama. 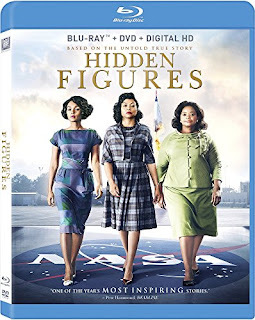 Nominated for a trio of Academy Awards, including Best Picture, Adapted Screenplay and Supporting Actress (Octavia Spencer) The picture recounts the trials and tribulations of three members of the aforementioned West Computing Group: Katherine G. Johnson (Taraji P. Henson), Dorothy Vaughan (Spencer) and Mary Jackson (Janelle Monae). We are flies on the wall when, without complaining, Katherine routinely has to run to a distant "Colored" ladies room despite the presence of one for whites right nearby. On another occasion, we witness Mary's frustration in furthering her education on account of the fact that blacks aren't allowed to matriculate at the local college offering the courses she needs. By film's end, both the bathroom and school are indeed integrated, albeit after an emotional intervention by NASA administrator Al Harrison (Kevin Costner). A worthwhile, teachable moment correcting a shameful chapter in American history. Blu-ray/DVD Combo Pack Extras: It All Adds Up - The Making of Hidden Figures; Audio Commentary by director Theodore Melfi and Taraji P. Henson; deleted scenes; Hidden Figures: Filming in Georgia; and a stills gallery.